The Anishinaabe were one of the largest First Nations groups in Canada and still are to this day. 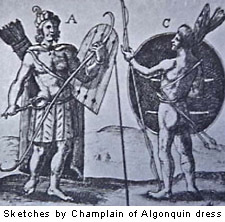 They were part of the Algonquian language family and included the Ojibwa (also Chippewa), Ottawa (Odawa) and Algonquin. The name Ojibwa was given to the group by the European colonialists and means "people whose moccasins have puckered seams". Today we use the native name, Anishinaabe, which means "person" or "first man." The plural is Anishinaabeg. Their territory included the northern shores of Lake Huron and Lake Superior from Georgian Bay to the prairies. In winter small groups dispersed into the woods to hunt for moose, deer and bear. In spring and summer they came together in larger camps where they fished, gathered wild rice and berries and tapped maple trees for their syrup which was boiled down into sugar. Those who lived near the Huron-Wendat developed some agriculture or traded with the Huron-Wendat for their agricultural products. The Anishinaabe lived in dome-shaped wigwams made by tying saplings sapling: a young tree which is supple and easy to bend. together at the top and covering them with sheets of bark or rushes. In winter they used more layers with moss insulation in between. A flap of hide served as the doorway and a hole in the top let out smoke from the fire. In summer the Anishinaabe travelled by birchbark canoe. Its seams were sealed with spruce or pine gum. In winter they used snowshoes and toboggans. The Anishinaabe were organized by clans. Each clan had its own symbol - a bird, fish, animal, etc. - called a totem. Children inherited the totem of their fathers, making kinship patrilineal.patrilineal: tracing one's direct line of descent through the father. There might be several clans represented in a band and the various bands felt unity with each other because of their inter-related clans. Like many First Nations peoples, the Anishinaabe felt there were spirits in all things. Their word for spirit was "manitou" and the Great Spirit was known as Kitchi Manitou. Teenaged boys, and sometimes girls, were made to fast in solitude for awhile until they were visited in a dream by their own guardian spirit. Those with a lot of spiritual powers became shamans and these religious leaders and healers gathered once a year at the Midewiwin, or celebration of the Grand Medicine Society. Social events were occasions for the elders to tell stories about the past and about supernatural figures like Nanibush, the trickster and spirit who put all living and non-living things into their present form, and Windigo, the spirit who waited in the dark cold woods of winter for some human flesh. Most frightening, an Anishinaabe could turn into a Windigo, himself, during conditions of starvation.